Boulder City is moving forward with creating the utility advisory committee that was tabled in October 2018 despite a wealth of public support at the time. 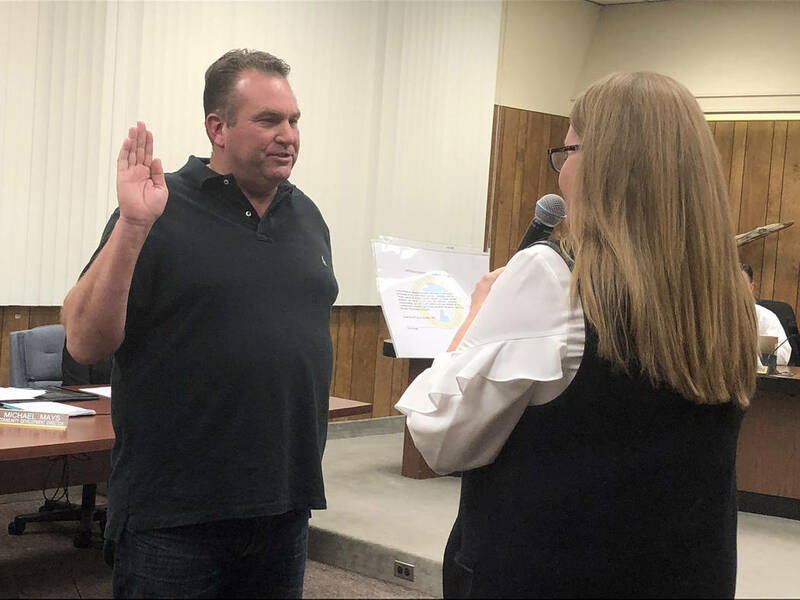 (Boulder City) City Clerk Lorene Krumm swears in Boulder City's newest Planning Commissioner Steve Rudd at the City Council meeting Tuesday, Jan. 22. At its meeting Tuesday, Jan. 22, City Council unanimously approved creating the committee that will assist the utility department and provide information and recommendations to council. Councilman Warren Harhay originally suggested the idea after a 2017 town hall meeting where residents and ratepayers expressed growing concern over increasing utility costs. “I’m very much encouraged to see this move forward,” he said Tuesday. Boulder City Utilities Director Dennis Porter presented two options for a five-member committee. One was more formal with each council member appointing a committee member and the committee’s recommendations made directly to the mayor and council through the city manager. It would act as official advisory body and the members would be subject to Nevada’s open meeting law. Porter said the second option was less formal with the city manager appointing the members and they would make their recommendations directly to him. It would not be an official advisory body or subject to the open meeting law. Under each option, Porter, as utilities director, would serve as a nonvoting ex-officio advisory committee member. “There should be a third option open to us that’s kind of a hybrid of the two,” Harhay said. “That sounds like a recipe for disaster,” he said about having each council member selecting a committee member. Additionally, he said the intent of the committee is to be transparent to the public and one way that is done is by following the open meeting law. McManus also suggested structuring it so that each member understands the purpose is to help the council as well as having them provide a semiannual report. “I think the city manager will have ample input through the utilities director,” he added. Councilwoman Peggy Leavitt suggested that requirements for the committee members not be so strict that it would be hard to find people who fit them. Mayor Rod Woodbury agreed with having the qualifications but making them balanced. Alan Goya, a local resident who serves as chairman of the Historic Preservation Committee, said these types of committees are valuable because they allow more members of the public to be involved. Recording the minutes is also helpful, he added. Resident Glenn Feyen said he thought the committee should be a direct link from the public to the council. Council approved having staff move forward with the more formal option but requested members be selected from volunteer applications as well as requiring a semiannual report. Additionally, it directed staff to come back with proposed qualifications for the members. Also at Tuesday’s meeting, council tabled voting on the 2019 land management plan until its Feb. 12 meeting because members wanted several properties removed. The parcels suggested for removal are: 23 acres of land north of Veterans Memorial Drive; 2 acres at 300 Railroad Avenue, the old water filtration plant; 5 acres of land west of Yucca Street and north of Veterans Memorial Drive; 773 acres of land at the Interstate 11 and U.S. Highway 95 interchange; approximately 586 acres at the southeast quadrant of the U.S. Highway 93 and U.S. 95 interchange; and approximately 1,100 acres at the end of Boulder Rifle &Pistol Club access road, which is east of I-11. Councilman Rich Shuman said he thought none of those properties should be taken off the land management plan without more detailed discussions about them, one by one. Additionally, council members issued a staff directive to work on changing the land management plan process, including adding a sunset clause for properties that had been on it for a long time. Those changes will come before council at a later time. ■ Approved 4-1 notifying the Clark County Debt Management Commission of the city’s proposal to issue general obligation bonds for an aquatic center. Shuman voted against it because he said he was not in favor of the ballot question for those bonds as it was written. ■ Approved extending the solar lease option agreement between Boulder City and Skylar Townsite LLC through 2022.